Pam’s Pictorama Post: It’s a dog day here at Pictorama. This postcard came to me via the gentleman from whom I purchased the series of Felix tintypes all of one group, back in December. (I wrote about them back in December in my post Echo Point, Katoomba.) Having visited Pictorama and made a killing on those tintypes, he came back with photos of other cat postcards he had purchased from the same fellow. None of them interested me much except this one which somehow ended up in the bunch and, despite its obvious dogginess, it appealed and I purchased it. The postmark on this card is incomplete and only Fremont is clear. There are Fremonts in a dozen states, but I can just about make out the abbreviated Nebraska in the postmark, further confirmed by the Nebraska of the recipient. All we know from the date is Nov 23, 8 AM without a year, but we can assume from the spats, watch fob, diamond tie pin and cufflinks, sported along with other bits of timely garb that this fellow hales from the earliest part of the 20th century. He’s just so jolly. That’s what appealed to me and this one may end up in my office to cheer me on my more dubious days. This bulldog is all self-confidence. He has the world on a string, he does, chomping on a big old cigar with is hands in his pockets! Show ’em how it’s done! The back of the card, shown below, entertained me further when the card arrived as it seems to be correspondence between two fellows in the postcard business. Addressed to Mr. Harry Tronschel, Humphrey reads as follows, Received your letter today. Will send letter. Will you please try once more to collect that bill for the post cards of that section gang for use? I need the money. Gee, you fellows must be awful busy in turning out so many pictures in one week. Mel. Visions of a thriving photo postcard business immediately spring to my mind. I will put this card someplace where I can see it often, a frequent reminder that a certain kind of swagger can carry you through a dog day. Pam’s Photo Post: This is in the treasured family photo general category of pics. 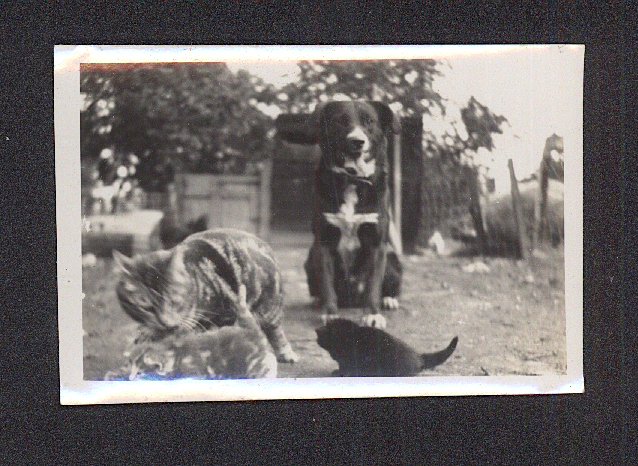 A handsome, faithful dog who is guarding this cat and her kittens. Of course I love the nice black and while (tuxedo-ish) pattern on the dog. What a very good doggie. Very serious and dedicated. Looks like a farm or at least a backyard farm as such. Pretty timeless, but there’s something about it that makes me think 1940’s. The spotty strip-y kitten is very cute, but of course the black one is my favorite. Blackie’s great granddad perhaps – wonder if there’s a little white star on his chest and little white spots under his arms?